Herbicide Resistance: How Did We Get Here? Due to the widespread adoption of genetically-engineered herbicide-tolerant (HT) crops and use of glyphosate, and observations of glyphosate-resistance in such weeds as palmer amaranth, common ragweed, giant ragweed, and tall waterhemp, there have been growing concerns about growers’ reliance on a small number of herbicides and modes of actions (MOAs), and the implications for effectiveness of weed control in U.S. agriculture. However, herbicide resistance is not a new problem. For example, beginning in the 1990s, scientists began observing resistance in various Amaranthus species and other weeds to Acetolactate Synthase (ALS) inhibitors–sulfonyl ureas and imidizolinones–which became widely used on U.S. corn, cotton, soybeans, and wheat during 1980s and 1990s (Heap, 2016). In order to inform discussions about herbicide resistance and management, this article provides information about trends and patterns in U.S. herbicide use and factors affecting them, updating estimates from Osteen and Fernandez-Cornejo (2013) with data and information from more recent USDA surveys (USDA-NASS, 1998-2013a) . The quantity of herbicides applied to field, vegetable, and fruit crops increased dramatically from the 1960s to the early 1980s, generally declined from the 1980s to the early 2000s, and, based on limited survey data, increased through 2012. Since herbicides account for such a large proportion of pesticide use– discussed below–herbicide use drives total pesticide use trends as well. The development and growing use of synthetic organic pesticides, other manufactured inputs, and improved genetic stock contributed to technological changes that increased total factor productivity of U.S. agriculture by about 2.5 times from 1948 to 2011 (Wang et al., 2015). Prior to the development of synthetic organic herbicides, such as 2,4-D, after World War II, U.S. farmers used such mechanical weed-control practices as straight-row planting, plowing, disking, and cultivation, but also inorganic materials such as arsenical, sodium, and sulfur compounds. The adoption of herbicides contributed to reductions in use of mechanical weed control, reducing labor and machinery costs. 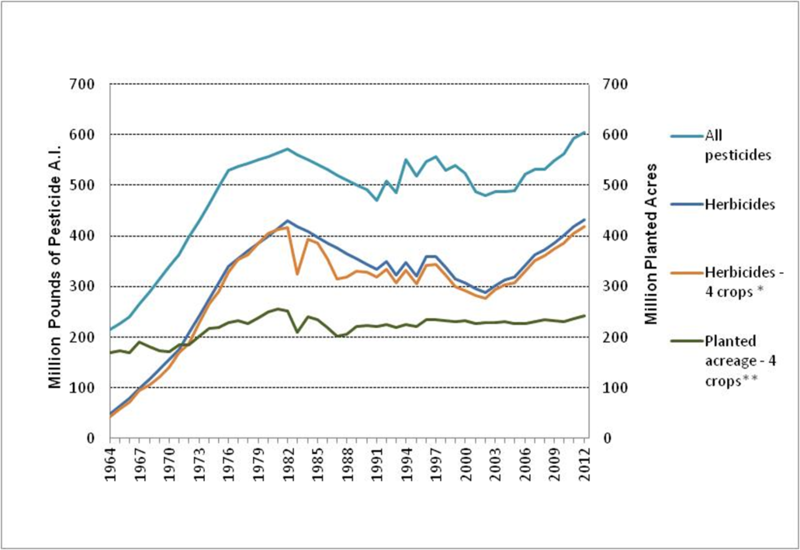 The adoption of HT crops and the increase in glyphosate use since the mid 1990s coincided with further reductions in tillage, including greater use of no-till farming. 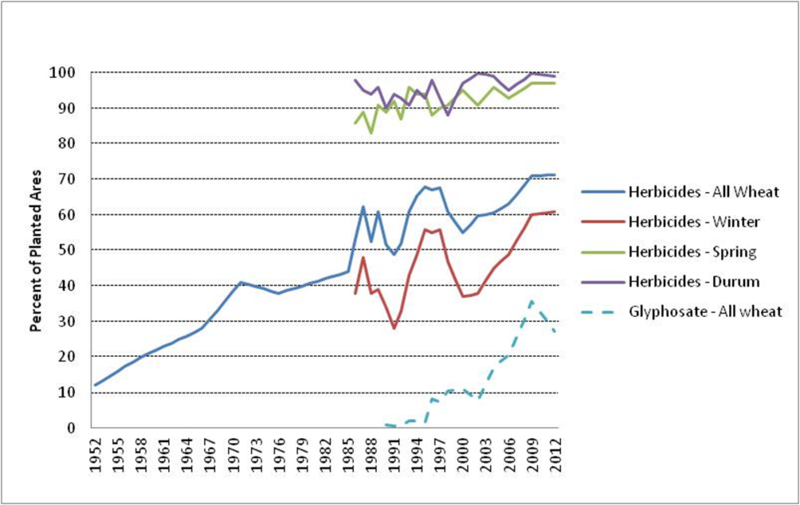 Figure 1: Pesticide and Herbicide Use, and Crop Acreage, 1964-2012 Click on image to enlarge. ** Corn, cotton, soybeans, and wheat. Excludes petroleum distillates, sulfur, and sulfuric acid. In 1964, when USDA conducted its first national pesticide use survey, herbicides accounted for less than a quarter of total U.S. pesticide quantity on major crops. Other categories include insecticides, fungicides, and other pesticides–fumigants, growth regulators, desiccants and defoliants. 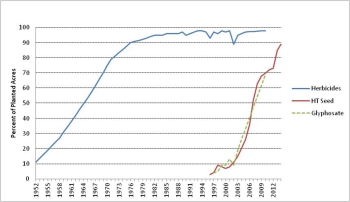 From 1964 to 1982, though, herbicide quantity grew six fold – from 48 million pounds of active ingredient (a.i.) applied to 430 million (Figure 1). 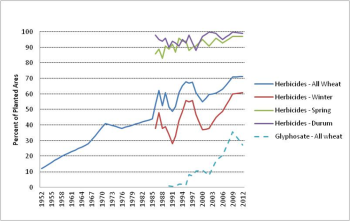 Herbicide quantity trended downward from 1982 to 288 million in 2002, but grew again to 433 million pounds in 2012, with greater glyphosate use on genetically-engineered glyphosate-resistant (GR) crops. In contrast, since 1964, insecticide quantity has trended downward, so now herbicides account for about two-thirds of U.S. pesticide quantity. Four crops–corn, cotton, soybeans, and wheat–account for the bulk of herbicide use (95%-97% of included crops since 1971) (Figure 1). Herbicides applied to corn and soybeans grew from 30 million pounds of a.i. in 1964–62% of herbicide use on included crops–by a factor of 12 to 377 million pounds a.i. 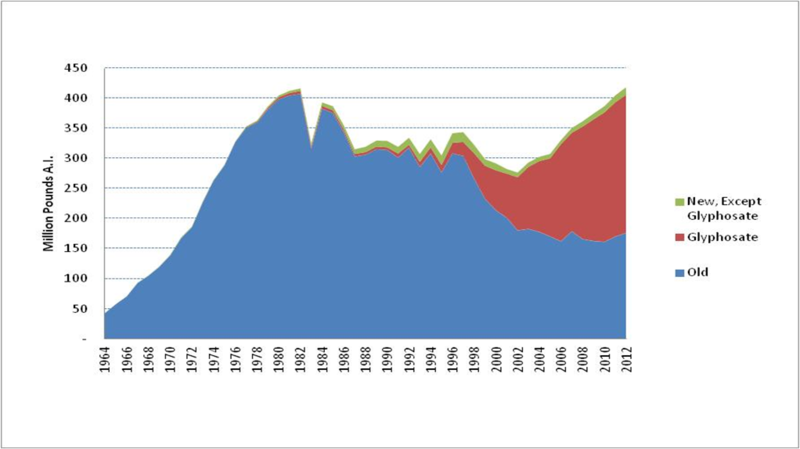 in 1982 (88%), fell to 236 million pounds in 2002 (82%), and increased to 355 million in 2012 (82%). 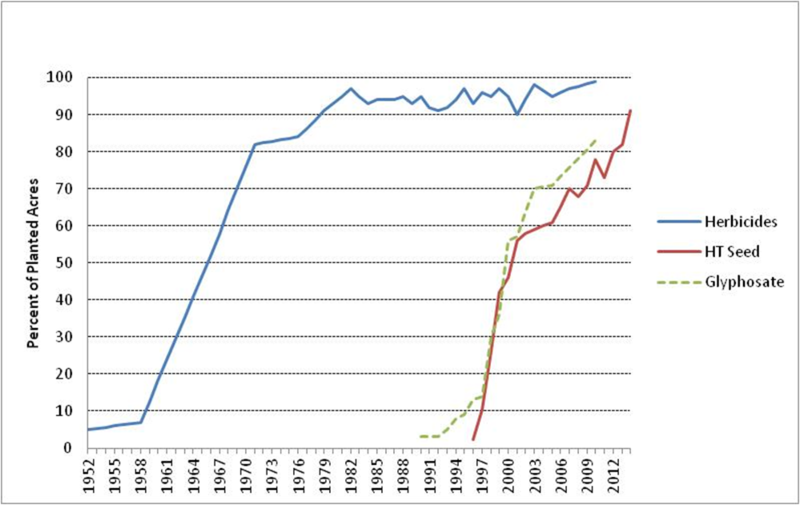 The quantity of cotton and wheat herbicide use generally increased from 1964 until the mid-1990’s, declined until 2002, and then increased in 2011 for cotton and 2009 for wheat. Acreage planted to these four crops is one important factor accounting for changes in overall herbicide use. One can see overall herbicide quantity fluctuating with total acres planted of the four crops. 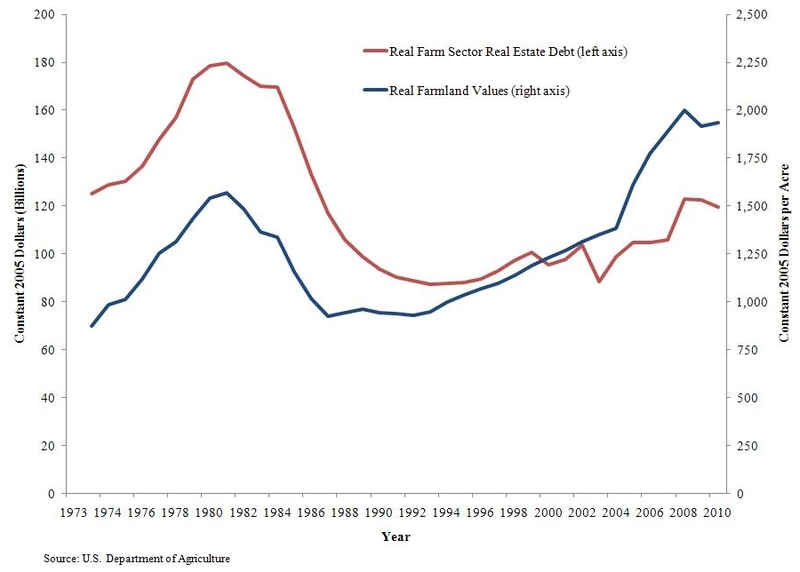 This includes the effects of the Payment in Kind (PIK) Program taking acreage out of production in 1983. Figure 2: Corn: Acres Treated with Herbicides, HT Seed, and Glyphosate. Click on image to enlarge. Figure 3: Cotton: Acres Treated with Herbicides, HT Seed, and Glyphosate. Click image to enlarge. Figure 4: Soybeans: Acres Treated with Herbicides, HT Seed, and Glyphosate. Click image to enlarge. Figure 5: Wheat: Acres Treated with Herbicides and Glyphosate. Click image to enlarge. The quantity of herbicides used on potatoes, vegetables, and fruit generally increased between 1964 and the late 1990s before declining. 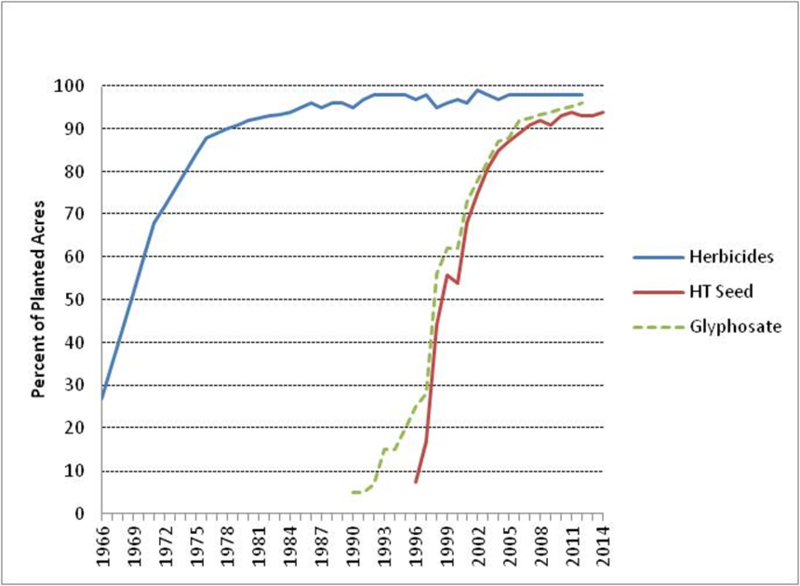 For example, potato acreage treated increased from 60% in 1966 to 80-94% since 1990, while apple acreage treated increased from 16% in 1966 to 40-65% from 1991-2011. Fruit and vegetable crops, though, accounted for a small share of overall herbicide use (5% or less of herbicide quantity for the included crops since 1971). During the 1980s and 1990s, ALS inhibitors, and to a lesser extent Acetyl-CoA carboxylase (ACCase) and Protoporphyrinogen oxidase (PPO) inhibitors, became widely used. These compounds contributed to declines in aggregate quantities between 1982 and 2002, because application rates were lower than with previously-used compounds, although declining crop acreages also contributed until the late 1980s. 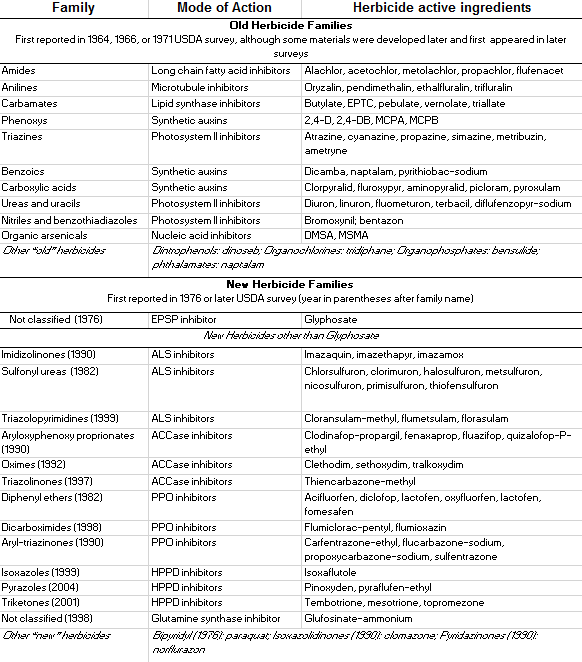 Scientists reported weed resistance to ALS inhibitors in the 1980s and 1990s, as mentioned earlier, but also to ACCase inhibitors in the 1990s and 2000s, and PPO inhibitors in the early 2000s (Heap, 2016). 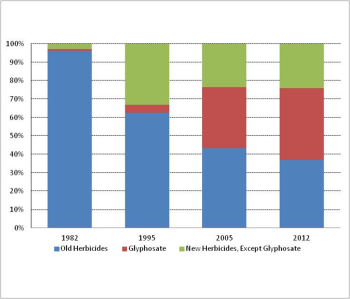 By the late 1990s, use of one compound, glyphosate, introduced in the 1970s, began to increase dramatically (Figure 6). In 1982, glyphosate only accounted for 1% of all herbicides acre-treatments to the four major crops. An acre-treatment is one acre treated with an herbicide multiplied by average number of applications per acre. This measure emphasizes the relative proportion of area treated with pesticides, accounting for multiple treatments and herbicides per acre. Glyphosate’s share was still only 4% in 1995, but rose to 33% in 2005 and reached about 40% by 2012. Glyphosate displaced materials in both “old” families or MOAs used since the 1960s or 1970s and “new” families or MOAs introduced in the 1980’s and 1990s. Since glyphosate is applied at higher per-acre rates than many other previously-used, newer herbicides, such as ALS, ACCase, and PPO inhibitors, increased glyphosate use accounts for most of the increase in herbicide quantity from 2002 to 2012, although increased crop acreage, especially corn, contributed (Figures 1 and 7). Glyphosate accounts for a larger share and other “new” materials for a smaller share of quantity than they do of acre-treatments, because glyphosate has higher application rates. However, materials in “old” families developed in the 1960s are still widely used, although some materials in those families were introduced in later years. Examples are triazines (such as, atrazine on corn), amides (acetochlor, registered in 1994, and s-metolachlor, registered in 1997, both used on corn, cotton, and soybeans, replaced alachlor and metolachlor, while flufenacet, used on corn and wheat, was registered in 1993), and phenoxys (such as, 2,4-D on corn, cotton, and wheat). Figure 6: Percentage of Herbicide Treatment Acres to Four Major U.S. Crops. Click image to enlarge. in the 1976 or later USDA surveys. Figure 7: Herbicide Quantity on Four Major Crops a, b. a Four major crops are corn, cotton, soybeans, and wheat b Old herbicides were in families first observed in the 1964, 1966, or 1971 USDA surveys; glyphosate was first observed in the 1976 USDA survey; and new herbicides were in families or MOAs first observed in the 1976 or later USDA surveys. Click image to enlarge. The rapid, widespread adoption of HT corn, cotton, and soybeans, which became commercially available in the mid 1990’s had a major effect on herbicide use trends by encouraging the application of specific herbicides, primarily glyphosate, which might otherwise damage the crop (Fernandez-Cornejo, 2004). 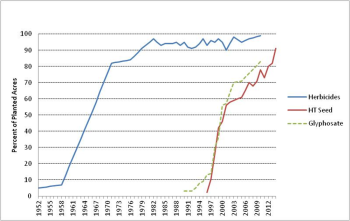 Between 1996 and 2012, the share of corn acreage planted with HT seed planted rose from 3% to 73%, of cotton acreage from 2% to 80%, and of soybean acreage from 7% to 93% (Figures 2, 3, 4) (Fernandez-Cornejo and Caswell, 2006; USDA-NASS, 2000-2014). The adoption of HT seed has had little discernible effect on the percentage of corn, cotton, and soybean acres treated with herbicides. In the early 1950s, most acreage of these crops was not treated with herbicides. By the mid-1970s, 20 years before the introduction of HT crops, more than 90% of corn, cotton, and soybean acres were treated annually. Where HT crops did have an impact was on the mix of compounds used. Figures 6 and 7 already illustrated the marked shift toward glyphosate over time. The percentages of acreage treated with glyphosate were closely related to the percentages of acreage planted with HT seed, with the increases occurring earlier for soybeans, followed by cotton and then corn (Figures 2-5). The result was greater glyphosate use on soybeans than on cotton and corn since the late 1990s. A much smaller percentage of all wheat acreage, for which genetically-engineered, glyphosate-tolerant seed is not available, was treated with glyphosate, but about 80% of durum wheat acreage was treated with glyphosate by 2012. The increased acreage of HT crops–along with falling glyphosate prices after its patent expired–is a factor in the dramatic increase of glyphosate use. Herbicides have become the dominant type of pesticide applied in the United States, while four crops–corn, cotton, soybeans, and wheat–account for the bulk of herbicide use. By the early 1980s, nearly all acres of corn, cotton, and soybeans were treated with herbicides. 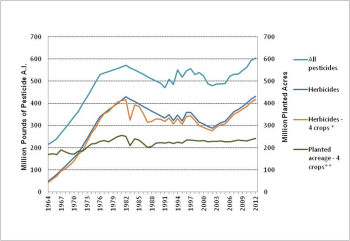 Adoption rates on wheat acreage proceeded more slowly, but now are quite high. 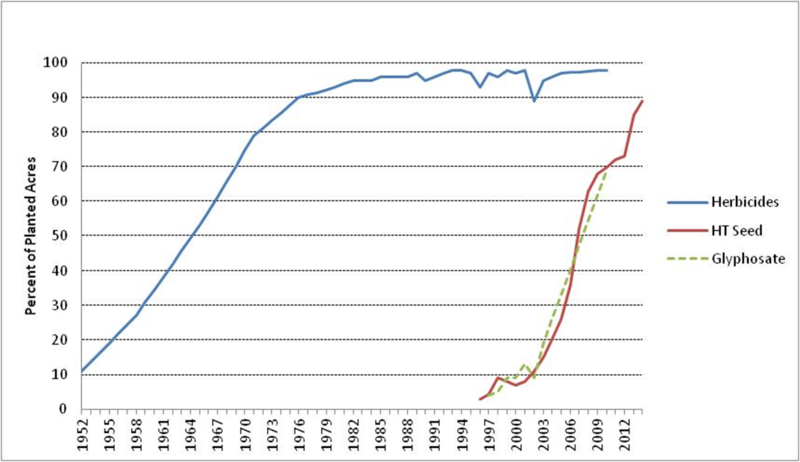 the adoption of genetically-engineered crops since the mid-1990s. 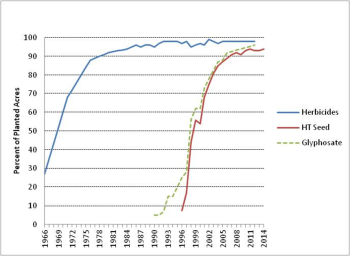 The use of ALS, ACCase, and PPO inhibitors during the 1980s and 1990s, along with declining crop acreage during the 1980s contributed to declining herbicide quantities. Adoption of herbicide-tolerant corn, cotton, and soybeans encouraged dramatic increases in glyphosate use that displaced use of many widely-used older and newer herbicides. The increased use of glyphosate, along with increased crop acreage, contributed to increases of herbicide quantities from 2002 to 2012.